Contrary To His Own Director Of National Intelligence, Trump Claims Russia Is No Longer Targeting America - Joe.My.God. President Trump, who has been under fire for not aggressively confronting Russian President Vladimir Putin over election interference, said Russia is no longer targeting the United States. 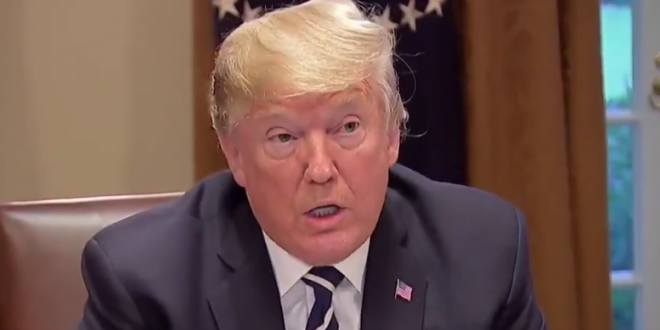 “Thank you very much, no,” Trump said in response to a question about whether Russia is still targeting the United States. Dear @realDonaldTrump: I am not a stable genius, but even I know that you forgot to put in the word “Russian” before “people” in your statement below. BREAKING: Trump just claimed that Russia is no longer targeting the US. FACT: Russia continues to target the US election system according to Trump’s own Intel agencies. It took exactly 22 hours for Trump to backpedal on his backpedal.